THINGS can change quickly in football – just ask Cam McCarthy. 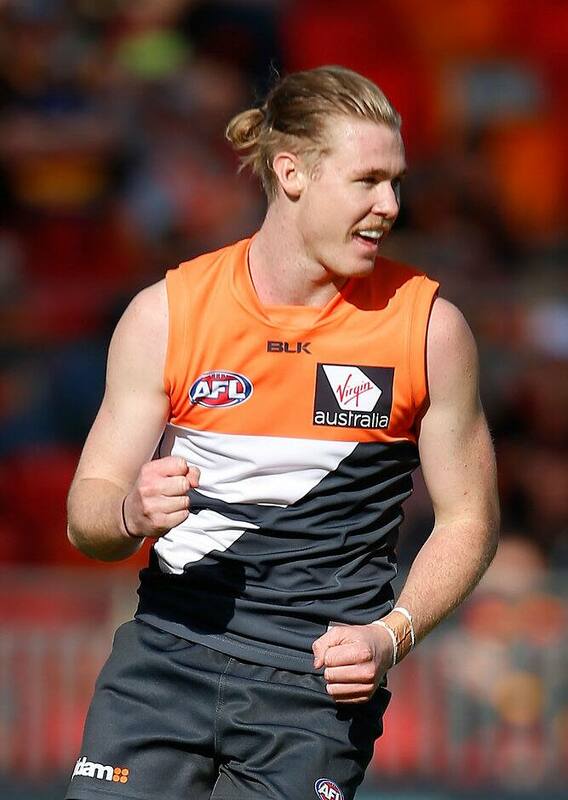 Last August, the Greater Western Sydney youngster came on as the sub in his debut match and kicked an important late goal as the Giants finished the season with a thrilling round 23 win over the Western Bulldogs. Fast-forward to the present day and McCarthy sits in seventh spot in the race for the Coleman Medal and is a mainstay of the GWS forward line. The 20-year-old, nicknamed 'Sunshine', has played every game this year and he's booted 21 majors - including a four-goal haul in Saturday's win over Adelaide that earned him the round eight NAB AFL Rising Star nomination. "It's been a bit of a surprise so far. I wasn't looking to play too many footy games this year in the ones; I was just looking to have a solid year in the twos," McCarthy admitted to AFL.com.au. "But I had a pretty good pre-season – not only myself, all the boys had a really good pre-season. "David Joyce, head of the athletic (performance) department, he's the new guy in town and he's really pushed us to our limits in pre-season and that's set us up for the year." Improved fitness, strength and maturity – not forgetting handy recruits Ryan Griffen and Joel Patfull - partly explains the Giants' rapid rise from six wins last season to the same number after just eight games this year. But so does the emergence of 20-year-old McCarthy as a sidekick for spearhead Jeremy Cameron. Questions were asked about who would stand up after Jonathon Patton ruptured his anterior cruciate ligament for the second time in round 21 last season and when Tom Boyd was traded to the Western Bulldogs. There were several contenders, and 193cm McCarthy knew he had some stiff competition to fill the breach. "I guess the door did open in the forward line. Not only for myself, but Rory Lobb's been training the house down and he's been playing real well in the twos and Jimmy Stewart, he's been unreal," McCarthy said. "So competition's strong and working with Jeremy up forward is unreal. He's super talented and works super hard. I just love playing footy with him." That McCarthy, Cameron and former No.1 draft pick Patton are yet to appear in the same forward line is a scary thought for rival clubs. It points to the depth of talent stockpiled by the expansion club, where McCarthy has become the 14th Rising Star nominee since 2012. From that group only Dom Tyson (Melbourne) has moved on, with the remainder at the forefront of GWS' rise as a genuine finals contender. "I think it's down to the coaching staff [having] real trust in the players and the players have real trust in the coaching staff about the game plan we're going through each week. It's one we know we can play competitive footy with," said McCarthy, who was the No.14 pick in the 2013 NAB AFL Draft. "Also the boys just love playing footy together. Obviously it was tough early on, the boys went through some tough times together, but now after a few wins everyone's jelling well. "Everyone wants to succeed as a football club, so I think that's spurring us on to play some real good footy."